After the infamous Cambridge Analytica scandal, Facebook knew it had to make major changes to its ad platform in order to win back public trust. Mainly, the public demanded more transparency in how ads are being targeted to them, and what companies are running ads on the platform. While it’s still far from perfect, Facebook has made strides in increasing overall transparency with its ad business over the past year. This week, yet another development was made to aid this mission - the Facebook Ads Library. 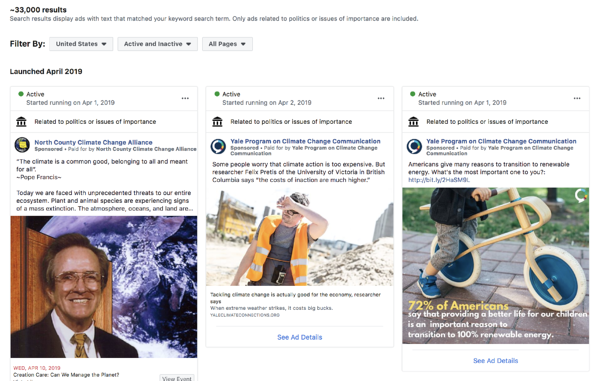 The Ads Library builds off of Facebook’s Ad Archive that was launched in 2018 - where users can see all active or inactive ads related to politics or other policy issues from May 2018 to the present. 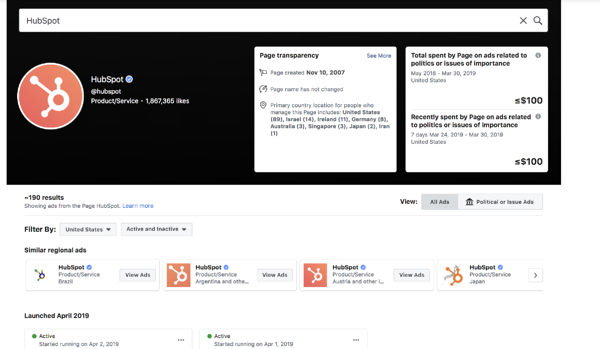 Now, the Ads Library has expanded this functionality, allowing you to view all active ads about any topic, even if the ad isn’t targeted to you. However, there are a few important factors of which to make note. First, the “Search” feature is only for political or issues ads. Other ads can still be viewed by searching the company page, but can not be found using keywords. For example, you can search “Climate Change” and see all related ads running, as well as existing pages using the topic, as seen in the screenshot below. However, if you searched for “IMPACT Live,” you wouldn’t be able to view current ads running using just that keyword. Additionally, non-political ads can no longer be viewed once inactive. The library will archive inactive political ads to create a robust library of previous tactics, but deemed it unnecessary to keep other ad types once they’re no longer being run on the platform. Many speculate that Facebook chose to limit this for non-political ads due to pushback from advertisers fearing that competitors would use it to evaluate the ad strategies they’ve used in the past. It's great that anyone can create an ad account and market their business on Facebook - however, any technology with these capabilities has the potential to attract those that aren’t necessarily well-intentioned. This also allows anyone - from governments, to journalists, researchers, or anyone else that’s curious - full access to monitor ads and see how the platform is being used in a bigger picture. 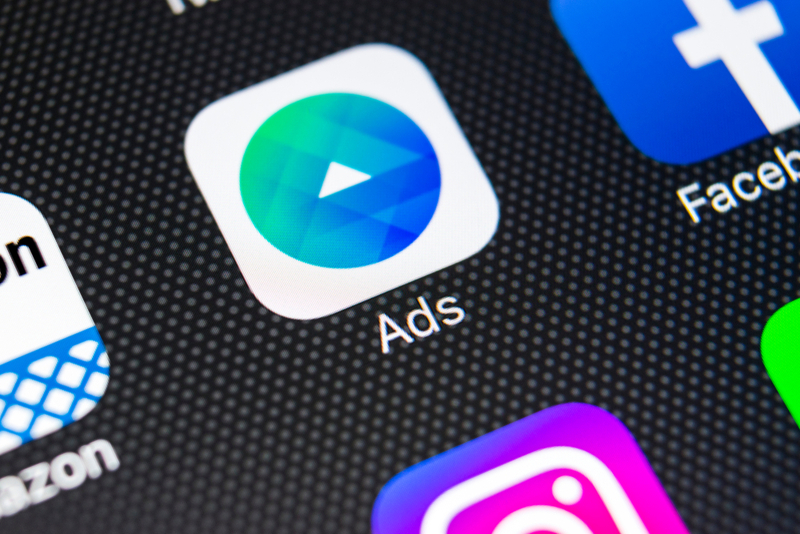 While this will certainly make ad practices more transparent, it will be interesting to see how it plays out in the long-term as Facebook’s Ad Library becomes more robust.